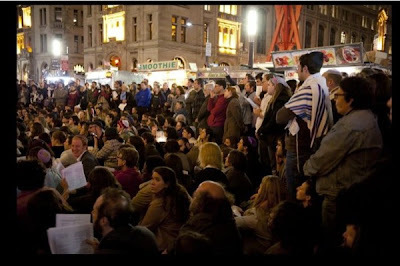 Yesterday, hundreds of young Jews were on a 25-hour hunger strike at Occupy Wall Street. Okay, so it was actually a Yom Kippur fast. What was so meaningful about Friday night's "Occupy Wall Street" Kol Nidrei services in front of Brown Brothers Harriman on Broadway at Liberty Plaza was how it stood in stark contrast to an earlier episode at Occupy Wall Street. Daniel Sieradski explained on his blog that two individuals (he didn't use "individuals") "were caught on video at Occupy Wall Street saying profoundly awful, stupid things about Jews, one of whom was consistently heckled and challenged by those around him." Contrast that act of anti-Semitism to Friday night's Kol Nidrei service across from Zuccotti Park attended by approximately 1,000 people. It was in the same place where the anti-Semitic comments were made days earlier. The Rabbinical Assembly, of which I'm a member, donated machzorim (High Holiday prayerbooks) for the prayer service. It was led by Avi Fox Rosen (Storahtelling), Sarah Wolf (JTS), and Getzel Davis (Hebrew College), who are being assisted in preparations by Yosef Goldman (JTS) and Rabbi Ezra Weinberg (RRC). Sieradski correctly complains that more media attention is being paid to the anti-Semitic comments than to the beautiful Yom Kippur prayer experience that took place in the same area. The young Jewish people who attended Kol Nidrei at Occupy Wall Street have been describing it as the most meaningful Jewish experience of their lives. Is such the fast that I have chosen? the day for a man to afflict his soul? Is it to bow down his head as a bulrush, and to spread sackcloth and ashes under him? Wilt thou call this a fast, and an acceptable day to the LORD? Is not this the fast that I have chosen? to loose the fetters of wickedness, to undo the bands of the yoke, and to let the oppressed go free, and that ye break every yoke? Is it not to deal thy bread to the hungry, and that thou bring the poor that are cast out to thy house? when thou seest the naked, that thou cover him, and that thou hide not thyself from thine own flesh? Then shall thy light break forth as the morning, and thy healing shall spring forth speedily; and thy righteousness shall go before thee, the glory of the LORD shall be thy reward. Kol Hakavod to all those who organized this so that the Occupy Wall Street participants would still be able to observe Yom Kippur. I love it. The movement of the 99% remembering their religion, welcoming the religion of all others.